Business students are looking to opt-out from six fee levy groups en masse, and to change how new groups get their funding. 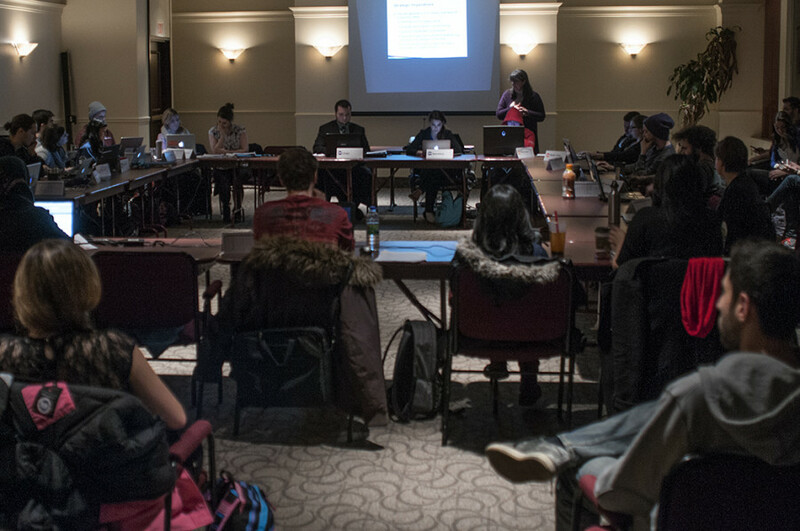 Two petitions were presented to Concordia Student Union Chairperson Nick Cuillerier by John Molson School of Business councillor Michael Richardson at the Feb. 12 council meeting. If put to ballot as referendum questions in the upcoming CSU general elections and voted in by undergrads, all JMSB students will stop paying six fee levies and how groups can request fees from undergrads will be permanently changed. The first petition proposes that any request for funding “for any group that is not directly and completely controlled by the CSU” is to be done on a “per faculty basis,” instead of the current system where a majority of voters decide on fee levies for the entire student body. The second seeks to have JMSB undergrads forgo paying fees to the Art Matters Festival, Cinema Politica, Community University Television, the Concordia Food Coalition, le Frigo Vert and Quebec Public Interest Research Group-Concordia. The combined cost of the six fee levy groups is $1.21 per credit. Students are automatically charged fee levies, and must opt-out of each fee individually if they do not wish to pay. A majority “yes” vote from undergraduates during the March general elections is required to pass these changes. The petitions were successful in attaining 500 signatures, the requirement for calling a referendum according to CSU bylaw 9.6. Cuillerier has verified that at least 500 signatures on each petition were valid. The three official representatives for the petition are executives on the Commerce and Administration Student Association—CASA President John-Michael Minon, VP Academic Loïc Sanscartier and Richardson, who is the association’s VP External. A special council meeting is being held on Feb. 19 at 2:00 p.m. in the CSU lounge to further discuss these petitions.